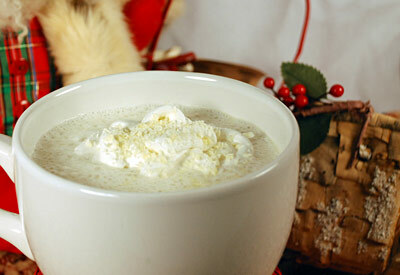 Creamy and white with an added kick to make you warm all over! Heat milk and vanilla in a heavy saucepan over medium heat, stirring often; do not boil. Remove from heat. Place white chocolate in a medium bowl. Gradually whisk about 1/4 of hot mixture into chocolate, whisking until chocolate melts; add mixture to remaining hot milk, whisking constantly. Stir in brandy and creme de cacao. Garnish if desired with whipped topping and grated white chocolate.